It wasn't that long ago that Jake, our mushroom buyer-friend in Coos Bay, predicted that this probably was going to be the best mushroom season in the last 6 years. Boy, was he right on! And, we've been on a mushroom whirlwind ever since: attending the PSMS annual mycological show in Seattle, collecting baskets of Matsutake on Mt. Hood and golden chanterelles in Port Orford, hosting the talented mushroom photographer Taylor Lockwood and much, much more. What a great year for mushrooms and for mushrooming! 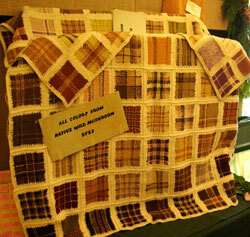 Mushroom dyed fabric was on exhibit. a program featuring Debbie Viess (Biologist, Contributing Editor to Fungi Magazine, Amanitaceae Expert, Co-Founder of the Bay Area Mycological Society), Dr. Britt Bunyard (Publisher and Editor-in-Chief of Fungi Magazine), and Taylor Lockwood (World Renowned Fungi Photographer and Author). We had a great visit at the show, taking everything in and renewing acquaintances with members that we'd lost touch with over the years since we've moved from Puget Sound to Port Orford. We were thankful to hear the talks by Debbie (No, Debbie, I don't think that we'll be dining on amanitas any time soon, but we did appreciate your message of "Stop and Drop" when it comes to mushroom hunting!) as well as Britt and to see Taylor's latest works. We just couldn't resist driving up to Seattle to the Puget Sound Mycological Society's annual show this year. The program was very enticing, featuring Debbie Viess (Biologist, Contributing Editor to Fungi Magazine, Amanitaceae Expert and Co-Founder of the Bay Area Mycological Society), Dr. Britt Bunyard (Publisher and Editor-in-Chief of Fungi Magazine) and Taylor Lockwood (World Renowned Fungi Photographer and Author). What a treat it would be to hear their presentations, we thought...and it was! In honor of the show, which was fabulous, we've chosen a recipe from the PSMS cookbook, Wild Mushroom Recipes, published in 1973, for our November Recipe of the Month. It's a lovely dish to serve at home or at potlucks. And, with the abundance of golden chanterelles this year, I think that we are all looking for ways to incorporate more mushrooms into our dishes! 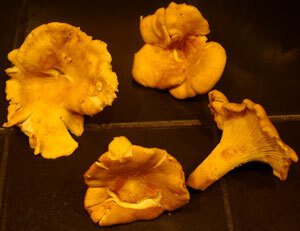 2010 is the year of the Golden Chanterelle. We can thank our dear friend, Linda Rollin, for this lovely recipe. She clipped it out of a newspaper which had adapted it from Langdon Cook's "Fat of the Land". We love the recipe because it's sinfully rich, generously endowed with golden chanterelles, comes together in minutes...gosh, what's not to like! I'm thinking that our next rendition of this pasta will include a generous portion of seafood - maybe shrimp or scallops or maybe crab, thanks to our local crab fishermen. After all, it's almost crab season again! 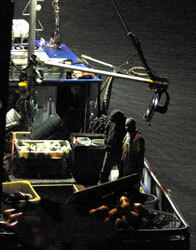 Our crab fishermen are a hard working crew.